Deliver the Dream helps families undergoing chronic illness or crisis to regain strength, mend spirits, and become families and kids again. By participating in one of our monthly retreats, families can relax, enjoy time together, form new friendships, and create support networks with other families struggling with the same thing. Providing highly effective programs designed to assist the entire family unit, Deliver the Dream helps meet a vital need for families experiencing life-threatening disease, debilitating illness, and other family trauma. Providing healing retreats that enable families living with serious illness or crisis to build bonds and form relationships with other families who are experiencing the same thing in order to regain strength in mind, spirit, and family…one retreat at a time. Deliver the Dream was founded by Pat Moran, past chairman and current board member of JM Family Enterprises, Inc. After many years of seeing families struggle to stay together as they coped with illness and crisis, Pat dreamed of a program that would help families alleviate stress, learn coping skills, and just enjoy being together as a family. 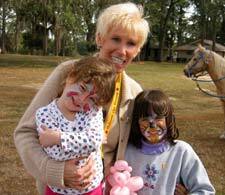 In 2002, Deliver the Dream held its first retreat for families with a parent with cancer. 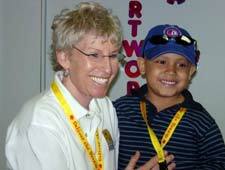 Since then, Deliver the Dream has brought hope and healing to nearly 10,000 family members across the state of Florida. Deliver the Dream is a 501(c)(3) non-profit organization. Pat Moran began her career with JM Family Enterprises, Inc. (JM Family) in 1983 as an entry-level clerk. She quickly rose through the ranks, learning the business firsthand with each position she held. In 1989, Pat was named President of Southeast Toyota Distributors and Executive Vice President of JM Family. She was then promoted to President and CEO of JM Family in 1992 and subsequently, in 2000, named Chairman of the Board and President of its core company, Southeast Toyota Distributors, LLC (SET), the world’s largest independent distributorship of Toyota and Scion vehicles. In 2003, Pat was named Chairman of the Board of JM Family, a position she held until her retirement in 2007. Pat was a foundation board member of the Committee 200, a national organization of women business leaders, as well as for the National Association of Automobile Dealers (NAAD) and the American International Automobile Dealer Association (AIADA). She was appointed by former Governor Jeb Bush to serve as a member of Enterprise Florida, which helps guide the state’s economic growth. She was a founding board member of Take Stock in Children, a program that provides mentoring and scholarships to disadvantaged high school students. Pat grew up in Chicago, IL and attended Marquette University in Wisconsin. She has three children and five grandchildren and remains actively involved in several organizations dedicated to disadvantaged children.